This study analyzes US demand for insulation products used principally for their thermal performance in residential buildings by material, housing type, project type, area of building, and region. Materials are also broken out by product form (batts, blankets, rigid boards, loose fill, blow-in, and spray-applied) and, for foamed plastics, by type of resin (rigid urethanes and polystyrene). Project types include both new housing construction and retrofit. Excluded from the scope of the study are insulation used primarily for its acoustic properties and insulation used in and around HVAC equipment, including duct work. Historical data for 2007, 2012, and 2017 and forecasts to 2022 are presented in current dollars (which are not adjusted to account for inflation). Historical and forecast data are also presented in volume terms by the following measures: pounds, square feet R-1 value, and square feet. In pounds and square feet R-1 measures, reflective insulation and radiant barriers are excluded. This study analyzes US demand for insulation products used principally for their thermal performance in residential buildings by material, housing type, project type, area of building, and region. This industry study presents historical demand data (2007, 2012, and 2017) and forecasts for 2022 by material, product type, housing type, area of building, and by region. Demand is provided in volume terms by the following measures: pounds, square feet R-1 value, and square feet. The study also evaluates company market share and provides analysis on industry competitors including American Rockwool, Applegate Insulation, Atlas Roofing, BASF, Carlisle, CertainTeed, Covestro, DowDuPont, Fiberlite Technologies, Huntsman, Johns Manville, Kingspan, Knauf Insulation, Nu-Wool, Owens Corning, ROCKWOOL, Sealed Air, and US Greenfiber. Data from the US Census Bureau were consulted in the preparation of this study and a list of related codes is presented here for informational purposes. However, these codes may not include all products covered in this report or may exclude some products of interest and the data have thus been adjusted accordingly. Most Freedonia studies utilize a similar methodology: historical data are collected from various industry, government, and other relevant sources, and forecasts are developed based on trends in key indicators, ratio and regression analysis, and interviews with industry participants. Information and data on residential insulation were obtained from numerous primary and secondary sources, including industry participants, government agencies, trade associations, online databases, company annual reports and investor presentations, and other Freedonia Group studies. Once overall insulation demand was calculated, estimates were developed for each housing type and area of building based on the intensity of insulation use in each segment. Demand estimates for specific materials were estimated based on available industry data and primary interviews with industry experts. Product demand in pounds was calculated using R-1 conversion factors – which were gleaned from published industry data and product specification sheets – for each material and product type. How Will the Economy Impact Demand for Residential Insulation? The residential insulation outlook is dependent upon a number of macroeconomic assumptions, including environmental and regulatory issues. This study will address what these assumptions are as well as their overall importance in the market. Following double-digit declines in demand during the 2007-2009 recessionary period, residential insulation demand increased in 2010 as residential building construction spending rose for the first time since 2006. Demand dipped once again in 2011 due to a slight decline in single-family housing starts, but rose sharply in 2012 in tandem with a 28% increase in conventional housing starts. 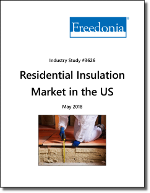 In 2017, the residential insulation market surpassed pre-recession levels, driven by annual gains in residential building construction of 13% during the 2012-2017 period. Building codes requiring insulation with higher R-values, particularly in subregions with harsh climates. Growth in the retrofit market, as rising consumer awareness of the energy efficiency benefits of insulation will prompt many homebuilders and DIYers to install high R-value insulation in attics and exterior walls. The incorporation of more insulation per unit built to better protect homes against heat transfer and (in many areas) to form the required air barriers to minimize the incidence of leaks. Advances in fiberglass insulation demand, as the use of thicker, higher R-value batts and blankets is increasing in exterior walls and attic. The rise in insulation prices will be spurred in party by increases in construction activity, which will boost demand for building materials and lead to price hikes. Price advances will be restrained by strong intermaterial competition. If manufacturers of one product – such as fiberglass insulation – raise prices too much, producers of competitive insulation types – such as cellulose insulation – can offer their products at a price advantage, limiting overall price gains. The residential insulation market enjoyed healthy gains during the 2012-2017 period, bolstered by increases in residential building construction activity. Through 2022, demand for insulation in the residential market is forecast to advance 3.9% per annum. SprayFoam.com cited The Freedonia Group, saying, "Foamed plastics are projected to be the fastest growing material in the residential insulation market through 2022. The materials’ ability to fully seal gaps and air leaks will support demand gains as recent IECC measures call for significant improvements in the reduction of air leaks in single-family and multifamily housing." What is the fastest growing material in the residential insulation market? How will eco-friendly technologies change the future of the insulation industry? Which materials are the most cost-effective? How does the retrofit market provide demand opportunities for insulation materials? Where are the best regional opportunities in the residential insulation market?